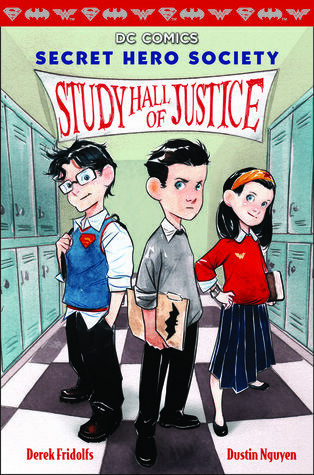 Batman, Superman, and Wonder Woman team up and investigate their new school! I have been meaning to read this since this one came out, sadly I never had the chance until now! I am not a big DC/Marvel reader, but I do know the characters and I do enjoy reading some comics. So I was pretty excited to see Batman, Superman, and Wonder Woman team up. Though not as adults, but as kids. And all of them are still discovering who they are and what they can do. But these are not the only characters in the book, oh no, be prepared to step into this school and go mad on the references to characters and stories. We spot the Joker (and his girlfriend Harlequin), Lex is also there to cheat, lie and take control, Poison Ivy, Circe, and so many more, I can keep talking but I will leave it to the readers to discover it for their own. I loved when it was Halloween and you truly saw the villains as they were/going to be when they are older. The book is all about our trio (and then mainly Bruce as he is the MC) and them discovering that their school might not be that good. Everything is suspicious. From the lessons, to how wrong is good and good is wrong, to teachers and students. Our trio has to discover what is going on and why they are being monitored so closely. I had so much fun going along with our trio and see if I could help out, if I could spot some hints. It was definitely fun to see them figure things out and to get closer to the truth. The most fun thing about the book was definitely how the book switched between story through comics and report cards, reports, chats, mails, and more. It made the book even more fun to read and made it very engaging and interesting. I was just eager to flip the page and see what I would get this time, mail? Chats? Report cards? Posters? Something else? The ending was great, exciting, we got a battle, a reveal, and more. I am a bit on the fence if I like every part though, as I am not a fan of cliffhangers. 😛 Guess I will just have to check out the next books in this series. The only thing I didn’t entirely like was the art. I get that the artist put tons of work in it, but sorry to me it often seemed hurried. At times you could still see various help-lines (hopefully that is the right word), and sometimes people were just blobs. Of course there were times that it did look quite nice and I liked the style. Too bad that was only sometimes. All in all, a very fun, exciting, great read, and I would recommend it to everyone!